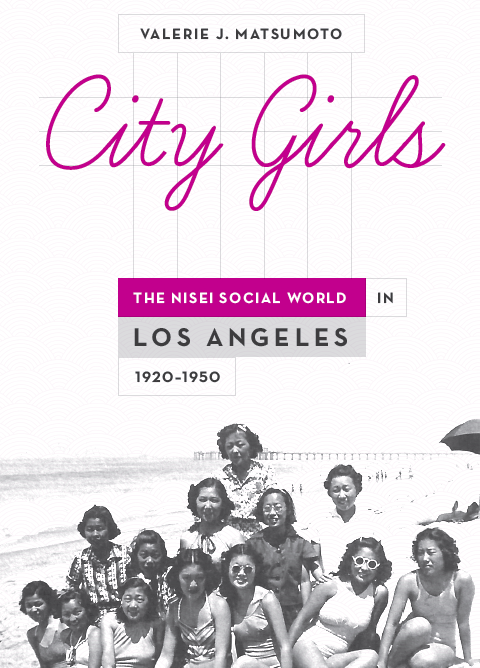 A book reception, celebration and signing with Professor Valerie J. Matsumoto, author of “City Girls: The Nisei Social World in Los Angeles, 1920-1950,” will be held on Wednesday, May 7, from 4 to 6 p.m. in Main Conference Room 11360 at the Charles E. Young Research Library on the UCLA campus. Even before wartime incarceration, Japanese Americans largely lived in separate cultural communities from their West Coast neighbors. Although the Nisei children, the American-born second generation, were U.S. citizens and were integrated in public schools, they were socially isolated in many ways from their peers. These young women found rapport in ethnocultural youth organizations, a forgotten world of female friendship and camaraderie that Matsumoto recovers in this book. Through extensive networks of social clubs, young Japanese American women competed in sports, socialized with young men, and forged enduring friendships. During the 1920s and 1930s, Nisei girls’ organizations flourished in Los Angeles, then home to the largest Japanese American population. In clubs with names such as the Junior Misses and Tartanettes, girls gained leadership training, took part in community service, found jobs, and enjoyed beach outings and parties. Often sponsored by the YWCA, Buddhist temples, and Christian churches, these groups served as a bulwark against racial discrimination, offering a welcoming space that helped young women navigate between parental expectations and the lure of popular culture. Indeed, their dances, meetings, and athletic events filled the social calendars in the ethnic press. As cultural mediators and ethnic representatives, these urban teenagers bridged the cultures of the Japanese American community and mainstream society, whether introducing new foods, holidays, and rituals into the home or dancing in kimono at civic events. Some expressed themselves as poets, writers, and journalists and took leading roles in the development of a Nisei literary network. Women’s organizing skills and work would prove critical to the support of their families during World War II incarceration and community rebuilding in the difficult years of resettlement. By bringing to life a dynamic and long-lasting world of friendship circles and clubs, “City Girls” highlights the ways in which urban Nisei daughters claimed modern femininity, an American identity, and public space from the Jazz Age through the postwar era. The event will include commentary by Professor Vicki Ruiz of UC Irvine. Books will be available for purchase. Sponsored by the UCLA Asian American Studies Center, Department of Asian American Studies, and Department of History. For a campus map, go to www.ucla.edu/map/ucla-campus-map.pdf. To RSVP, go to http://citygirls-aasc.eventbrite.com.